The bitter taste in my mouth continues so my investigation goes on. 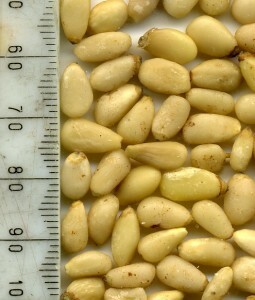 The suspect ‘baby pine nuts’ came from Julian Graves store in Livingston a couple of weeks ago. I remember they had both regular and small pine nuts and we bought the small but as I quickly discarded the packaging I don’t have any information about them beyond my memory. So off to the Edinburgh Julian Graves to see if I could find some more but this is a small store and only had the regular pine nuts. I bought them for comparative purposes. Here are the pictures of the two types of nuts. The smaller ones appear to be more oily – they stuck to the scanner lid when the others didn’t. Perhaps they are just lower grade and off? The new packet I have does not state the country of origin which we need if we are going to track down the species. I did think this had to be listed for legal reasons in the UK. Next step write to Julian Graves and ask them. Comments are now closed on this post. You can read and explanation here. 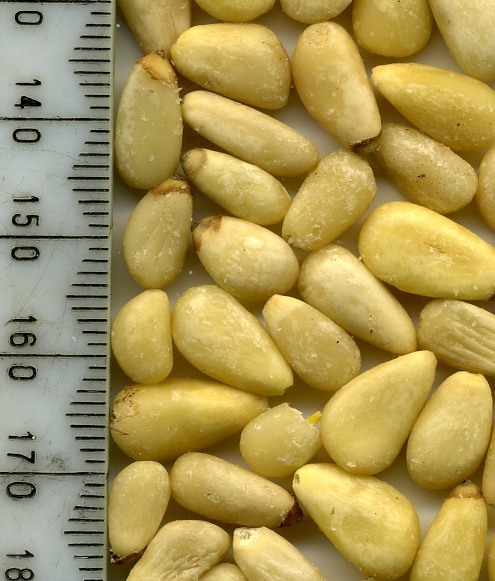 Previous Post Bitter taste after eating for days – caused by pine nuts? I have noticed all day that no matter what I ate, I had a bitter after taste. I was curious so I googled it. Maybe, it is the pinenuts since I had just bought Italian pinenut cookies freshly made from a reputable shop yesterday. I don’t know the origin of their pinenuts; but between the 2 photos you exhibit in this site, the pinenut cookies I bought look like the ones on the left or JC Livingston variety. I’m relieved that I didn’t eat anything arsenic or maybe that my organs are giving signs of something ailing from within. I have to agree with this bizzare experience – i thought i was about to have liver failure or something !!! and i’m pretty fit and healthy for my age……. can’t drink or eat anything without that horrible taste and they were definitely chinese pine nuts too……. anyone else in NZ had this issue ???? got the same problem at the moment and will investigate where the health food store who sold me the nuts sourced them from. The only thing that tastes better this bitter flavour are my chinese herbs! It’s relieving to know that someone else has had these same symptoms…..I just developed them after having pine nuts. Have never had this reaction before…..strange. How long can I expect this reaction to last? Thank God that I got hold of this blog – I was bored last weekend and went out to shop at the supermarket. Passed by the Nuts aisle and suddenly saw the pine nuts nicely packed in small bags. Have not eaten them since 20 years and bought 2 packs. was so excited that when came home ate one whole pack. since then I cannot believ how on earth I have bitter taste in the mouth which is lasting for more than 5 days. made me get worried. not sure whether need to call my doctor. How Long does this bitter taste last and is there anything one can do to speed up the recovery period ? I checked the pine nuts I purchased from Trader Joe’s and they were from Korea or Russia and they were the small pine nuts. Thanks for publishing this info…obviously I have the bitter taste too, especially after eating sweet foods. Any food, really. I suspect there were pine nuts in my main course the other night. A fellow diner has the bitter taste, too,having eaten the same main course. But 2 others who ate it have no bitter taste. It was 3-4 days later that everything became bitter. At first I thought all the pickled cucumbers I made on the weekend were to blame. What a strange thing we share.It makes you wonder if we will ever understand fully what has happenned. HACE DOS DIAS EMPEZAMOS A SENTIR SABOR AMARGO TRAS INGERIR ALIMENTOS E INCLUSO BEBIDAS, INICIALMENTE PENSAMOS QUE ERA DEBIDO A UNA TARTA QUE ELABORO MI MARIDO EN CASA Y QUE NOS HABIAMOS INTOXICADO O QUE TENÍAMOS ALGUNA INFECCION MICOTICA EN LA LENGUA, PERO AL ENCONTRAR ESTA PÁGINA RECORDAMOS HABER COMIDO PIÑONES HACE CINCO DIAS (COSA QUE NO HABIAMOS HECHO DESDE HACÍA AÑOS) EL SABOR AMARGO EMPEORA CON EL PAN, DULCES, CHOCOLATE Y BEBIDA AZUCARADA. NOS ALIVIA MUCHO ENJUAGARNOS LA BOCA CON AGUA Y BICARBONATO. MAÑANA VAMOS A LLEVAR LOS PIÑONES Y A EXPLICAR NUESTRA EXPERIENCIA A SANIDAD. MI HERMANA QUE ESTUDIA NUTRICION TAMBIEN INVESTIGARA EN EL DEPARTAMENTO DE TOXICOLOGIA DE SU UNIVERSIDAD. So, how is it possible that the same thing is happening on the opposite side of the globe? a) Spain has also fallen victim to ‘globalization’, and are importing pine nuts from the far east. Anyone else have ideas as to why this is happening? Two days ago, we began noticing a bitter taste when eating food, including drinks. Initially, we thought it was due to a cake my husband made at home that had poisoned us, or that we had a mycotic infection on our tongues, but having found this blog, we remembered that we’d eaten Pine Nuts five days ago. (something we hadn’t done in years). The bitter taste is worse with bread, sweetes, chocolate or any sweetened drink. Brushing and gargling with water and baking soda (bicarbonate) has helped a lot. Tomorrow we’ll be taking the Pine Nuts and our experience to the Health Authorities. My sister, who studies nutrition, will also be investigating this in the Department of Toxicology at her University. How fascinating – here I am in Australia and have had the same bitter taste at the back of my tongue whenever I eat or drink. I’ve been cheing gum a lot to help it. I wondered if I was getting sick with a cold or something, and of course googled it… I TOO ate pine nuts in a sald at a friends place 2 nights ago!! It can’t be coincidence – there must be a connection. I have eaten pine nuts before, and sometimes the taste lingers for an hour or so, but nothing like this. I hope it goes away – I love my food, but evrything tastes so strange!!! Hello; I’ve just emailed Julian Graves customer care for their response to this. I also have experienced the worrying foul metallic taste, have recently eaten several packs of Pine Nut salad from Julian Graves, and also have had a rather upset stomach, which is very rare for me. It’s a great way to cut down on alcohol, as wine tastes unbearable at the moment. I had the same bitter taste after eating pine nuts. I took the pine nuts from the hotel where I work. It’s the second time it happens with the same pine nuts package (yes, I’m a fool). Tomorrow i’m going to get some info and share it in this forum. Till then and sorry if my english is not good. The only info that I can find is that they come from China, and the package is in Spanish and Portuguese, so they probably develop the nuts to Spain and Portugal (or Brazil). From Croydon, Australia my husband & I too have this problem from eating Pine Nuts 1 week ago. Horrific metallic/bitter taste, nausea, indegestion that won’t go away. It started the day after eating them. Unfortunately I had an extra handful of them the next day. Bought them from a local bulk food store(they are the smaller type of nut). Was at the point of seeing Dr., can’t drink tea,coffee,milk,wine(bugger), can only taste sweet foods. Thanks everyone for your tips on what to do. Also heard Charcoal tabs may be a help(check warnings on those though!). same experience from Barcelona, Spain, it’s horrible! 4 days and we have still the same bitter taste! A mi me ha pasado este fin de semana tras haber comido piÑones de la marca “Casa Pons” compados en el Dia en Barcelona. Es algo horrible, y he estado muy preocupado durante 3 dias, hasta encontrar este y otros blog. Que alivio! WOKE UP THIS MORNING WITH A BITTER TASTE IN MY MOUTH WHICH HAS BEEN WITH ME ALL DAY. NO OTHER SXS – FEELING MY USUAL. I’M A PHYSICIAN AND MY HUSBAND IS AN ENT DOCTOR. WE TRIED TO FIGURE OUT WHY? HE SAID TO GOOGLE IT AFTER HE COULDN’T COME UP WITH ANYTHING TO BE THE CAUSE. WE HAD PINE NUTS IN A ROASTED DISH WE PREPARED 2 NIGHTS AGO. THESE WERE FROM TRADER JOE’S AND THE PACKAGE SAID THE PRODUCT WAS FROM KOREA, JAPAN , VIETNAM. I BELIEVE THIS IS THE CULPRIT BASED ON ALL THE OTHER REPORTS CITED. JUST HOPE IT GOES AWAY – ITS ANNOYING!!! Thank you all for your comments. I find it odd that we are hearign this from Spain, NZ, Est coast Us and elsewhere adn the symptons are so similar. After researching online(big mistake) I was convinced this was it–some terrible affliction was upon me and then I happened upn this blog. Very helpful but remember, to do the due diligence and if it does not disappear, to see a doctor and let the professionals diagnose it. Just fascinateed that a food source is having this much impact upon so many people worldwide. oh wow – this is awful!! Pine nuts from Naturalife, fresh pack, had them Sunday eve lightly toasted over my salad, and Tuesday, terrible taste!!!! Bought at Loblaw’s in Toronto. The pack does not indicate where the nuts come from, only that other nuts etc are processed in the same plant. This is only day 2 for me, hope it doesn’t last too much longer. Hubby had same nuts, but no reaction. I ate at a restaurant in Middletown, NY on 4/10/10 and had “baby” pine nuts in my salad…low and behold… on Monday or Tuesday started up with this bitter taste all the time and much worse when I eat. I’ve been eating and cooking with pine nuts for years and nothing like this happened so I believe either these nuts are a different species or had gone bad (fungus?). Can’t wait for the bad taste to end. Yuck. Has anyone seen any toxicology on these nuts? Just wondering about the chemistry here. I’ve had this metallic aftertaste all day, Monday, no matter what I eat. Food tastes OK when I eat it, but a few minutes after I’m finished, there’s this bitter metallic aftertaste. So I googled and thankfully found this blog. Turns out Saturday Night I made Pasta with a delicious Pesto Sauce I bought at BJ’s – supposedly made from only Organic Ingredients. My wife ate it but has no symtoms. Although I don’t have food allergies that I’m aware of, I must have some allegeric reaction to something I ate – probably the Pesto / Pine Nuts. Yes indeed, thought I had some new strange disease only to be relieved about the pine nuts!!! Had a lovely salad on Sunday loaded with them. Even candy tastes bad. I said this in your other thread, but it bears repeating (perhaps). I have been buying tiny pale and somewhat dryer than I’m used to pine nuts from Trader Joe’s for months with no ill effect. This week I found some really lovely-looking, larger and darker than I’m used to pine nuts at Whole Foods and bought them. They were DELICIOUS! And two days later, I have pine mouth. So much for small nuts being related to this. So much for small nuts being related to this. I don’t know where those nuts were from, as I’d already disposed of the packaging. They were in the bulk section, but prepackaged in a plastic tub.